Disclaimer: I can’t give justice to how amazing this man is; you will just have to meet him yourself. What do you say to the man who, when in his early twenties walked across the Edmund Pettis Bridge in a nonviolent march during the civil rights movement, was almost beaten to death, and never once gave up his beliefs in peace and nonviolence? “I am very pleased to meet you” just doesn’t seem to cover it. 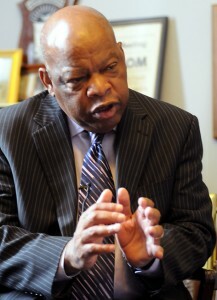 Congressman John Lewis is a powerful man who’s every word rang with history, faith, and conviction. He told us “For me, the philosophy of nonviolence is not a tactic, but a deep value that affects the way I live.” It is with this value that he walked across that bridge in Alabama March 7, 1965, and it is this value that he brings with him to Congress. He believes in peace and that, “If we can teach our children to put people down because of race, religion, or gender, we can also teach them the way of peace.” A man of great faith and family roots, he told us stories of growing up and the power of prayer and community. He told us about raising his chickens, getting up in the morning to feed them, naming them, talking to them, and preaching to them. 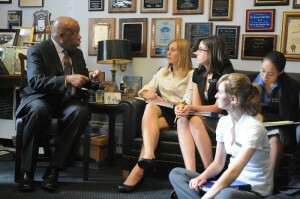 He even said that he wished half the people in Congress listened as well as his chickens did! We all got a great laugh with him on that. Thank you, Congressman John Lewis. I do believe we are ready to go and make some noise now. I was nervous about this interview. Aaron and I were the ones who first wrote and called Ron Paul’s office to request an interview. Now, our efforts, along with those of our teacher and Tom Tucker in Congressman Farr’s office had paid off. Nonetheless, we felt it was our tails that were cooked if this interview was anything less than great. I didn’t know what to expect and as soon as Congressman Paul came into the room, the unexpected happened. He walked into the room and his presence was different than any other person we had met so far. Usually when people walk into a room, you get a feeling, a feeling in your gut about who this person is and what kind of energy they give off. When Congressman Paul walked into the room, I couldn’t pinpoint how I felt exactly. He had something powerful about him like when Former Secretary of State George Shultz walked into the room, but at the same time this power that was joined by a certain humility and naturalness that made him seem approachable. As he sat down with us we introduced ourselves, explained why we were there and what we were doing and then gave him the chance to talk. All of a sudden, he stood up and began to talk. He spoke with such passion and intensity that I knew that every word out of his mouth held tremendous meaning and importance for him. He burned through question after question with heartfelt answers. It was clear to me that this was a man who felt so strongly about his ideas that he stood throughout the entire interview! This is part of what was so powerful to me about this man. Here was a person who had so much to convey to us and with such vigor, that it was impossible for him to sit. For a half an hour he spoke with sincerity, fervor, honesty and respect. 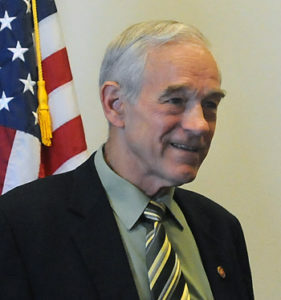 I found a similarity between Ron Paul and Ralph Nader. Both men challenge and question our government in a passionate manner, although Nader does so with a more subdued style. Congressman Paul talked a lot about the right of the people, focusing on how government has become overdeveloped, too big, and too powerful. Sitting there with this man and listening to him speak so passionately about so many different ideas, I couldn’t help but consider them myself. He spoke of things I didn’t even think about before I met him. This interview with Congressman Paul made me look at our government in a whole new light. He walked out of the room the same way that he came in, with a quiet kind of indefinable power, and the interview was over. Though his entrance and exit baffled me, during the interview I felt exactly what this man was all about. He was a man who stood for his beliefs when he talked and believes passionately in all that he talks about. He’s a man that wants to change the world.